Recombinant monoclonal antibody to Bet v 1. Manufactured using AbAb’s Recombinant Platform with variable regions (i.e. specificity) from the hybridoma BV16. Immunogen: Bet v 1-A, a major allergen of the European white birch. Specificity: This antibody binds to Bet v 1. Application Notes: This antibody binds to Bet v 1 via an epitope commonly used by allergogenic IgE. Fab versions of this antibody have been used in co-crystallization studies of Bet v 1. Note on publication: Describes the generation and characterization of the BV16 antibody. 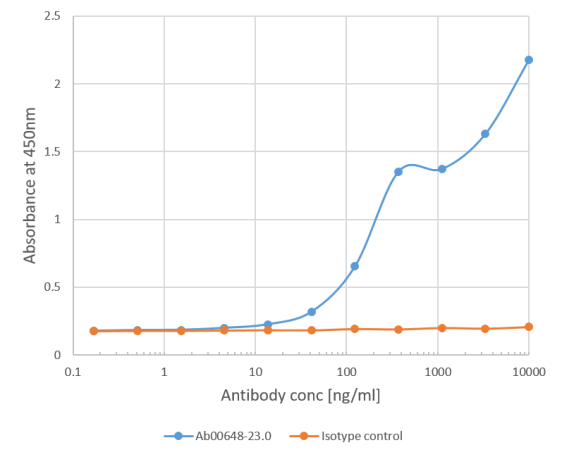 Binding curve of anti-Bet v 1 antibody BV16 (Ab00648-23.0) to Bet v 1 ELISA Plate coated with Bet v 1-A (RayBiotech, 228-22389) at a concentration of 2 µg/ml. A 3-fold serial dilution from 10,000 to 0.1 ng/ml was performed using Ab00648-23.0. For detection, a 1:4000 dilution of HRP-labelled goat anti-rabbit antibody (Bio-Rad) was used. 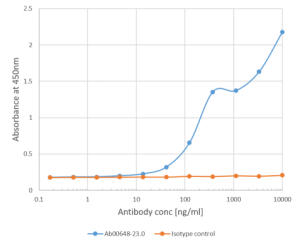 Absorbance at 450nm does not reach a plateau but falls slightly before increasing once more, as also observed for Ab00649-23.0. This is suggestive of two binding sites on Bet v 1-A for which Ab00648-23.0 has differing affinities.